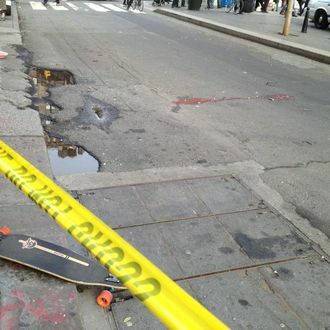 A 24-year-old skateboarder died this afternoon after being hit by a delivery vehicle on Union Square West near 17th Street, Gothamist reports. "The kid was picking up his skateboard when the truck hit him," said one witness. "The driver wasn’t paying any attention." But according to the NYPD, which said no criminality was suspected, the rider "lost control" of his board and "fell under" the Mitsubishi truck, a version of events backed up by another bystander: "He lost his balance, and I saw the skateboard slide underneath the truck, and as soon as his head hit the floor, the truck’s back wheels ran over it." Of the other witness’s conflicting account, she said, "It happened way too fast for that." Hunter Stuart, who took the attached photo of the aftermath, said he did not see the accident, but spotted a broken pair of sunglasses and lighter sitting strewn in the bloody street.